T-shirt sizes: XS, S, M, L, XL and XXL. Technical Tees are available in Men's and Women's sizes. Brokerlink 8 Person Marathon Relay Run : Min. of 2 and a Max. of 8. VALE 5K Run/Walk Family : Min. of 2 and a Max. of 5. The 5K Family registration is for parents with immediate children only. Team registrations are NOT allowed in the family 5K event. Teams wishing to register should register individually. All team members must register at the same time, during one transaction. 1km - Participants must be able to complete the course in 15 minutes. This will allow organizers time to prepare for the upcoming events. 5k/10k - Official time limit for the 10k is 2 hours and 15 minutes. All 5k participants will also fall within the 10k time limit. All participants proceeding slower than 13.5 minutes per km. may be asked to walk along the sidewalks and obey traffic rules. All 5k and 10k walkers and runners will be allowed to finish the race and get an official time regardless of their pace. 1/2 Marathon - Official time limit for the 1/2 marathon is 6 hours. This generous time limit allows event access to most levels of walkers. Slower participants may be asked to walk along sidewalks and obey traffic rules. Full Marathon Walk - Official time limit is 8 hours. The course closes at 2:00 pm. Slower participants will be asked to walk along the sidewalks and obey traffic rules. Walkers start at 6:00am and must note that while the roadway is pyloned and all markers are in place, police and marshals are not on duty until 7:45 am. Walkers must obey the rules of the road at crossings until the locations are policed. Full Marathon Run and Relay - Official time limit is 6 hours. Slower participants may be asked to walk along the sidewalks and obey traffic rules. Due to the time limit, NO WALKERS PLEASE! All Events - The race clock will officially remain operational until 2:00 pm. * At the discretion of the POLICE, due to traffic control and runner safety, slower participants may be asked to walk along the sidewalks and obey traffic rules. While we do not have any official age restrictions in our events many races do not permit runners under 16 years of age to participate in the full marathon. We require a parent or guardian signature for runners under the age of 18 in all our events. If you register online ticking the "Yes" box to the waiver has satisfied us that a parent or guardian has approved the registrant's choice of distance. If you register manually there is a line included for a parent or guardian signature if the applicant is under the age of 18. The following items are not permitted in the SudburyRocks!!! Race-Run-Walk: pets, animals, skateboards, bicycles, roller blades, motorized chairs or any other types of vehicles (other than official Race vehicles). Note 1: We do allow baby joggers/strollers but request those entrants please start towards the rear of your event to allow safe space for walkers and runners. 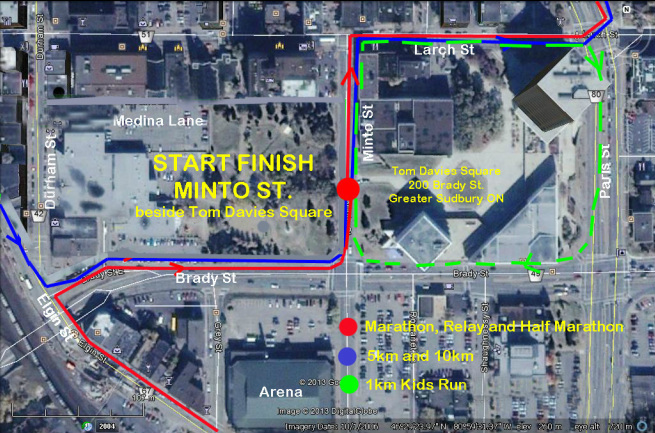 Note 2: We will attempt to allow non motorized wheelchair participants in our 5km race. For safety reasons we CANNOT accommodate wheelchair athletes who wish to race. Those wishing to participate must start toward the rear to allow safe space for runners and walkers and then stay safely within the running pack as they proceed through the course. Please contact the race organizers if you wish to enter the run as a wheelchair participant. The organizers will go over all logistical details with you. There is no specific category for wheelchair participants. Headphones are discouraged as they impair full awareness of surroundings and reduce the ability to hear instructions on course. If you do wear headphones you are using them at your own risk. Please keep the volume at a level that allows full awareness of your surroundings. These regulations are for your safety and the safety of the other participants in the race. If you have any questions, please contact the Race Organizers. All registered participants will receive a bib number with attached timing chip that must be worn on race day. Please put any necessary medical and emergency contact information on the back of the bib number with a pen or waterproof marker. Please do not alter the bib in any way. The bib must be visible and worn on the front outside of all clothing during the entire race. Bib numbers are non-transferable and must be worn by the registrant to whom it has been assigned. Make sure your race bib is clearly visible on the front of your torso. Make sure your bib isn't folded or wrinkled. Keep your bib pinned in all four corners. Don't cover your bib with clothing, runner belts, or water bottles. ​Note: Marathon Relay participants will be provided with ankle style ChampionChips. There will be one chip per team and the unit will be transferred to different team members at the Relay Stations. These ankle style chips must be returned after the race completion. Course Certification is a process by which a course is measured according to international standards and the measurement data is reviewed by a recognized certifier. Once the data is verified and accepted, a certificate with a course ID number is sent to the measurer, who then forwards a copy to the race director. Certified Marathon Courses: The Boston Marathon requires qualifying times that are obtained on a certified course. The national course registrar sends the list of certified courses to the BAA which then accepts applicants based on the information it receives. the same exacting methods and are accurate.